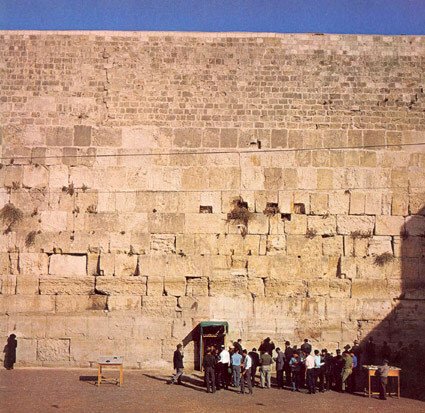 After the destruction of Jerusalem in AD 70 by the Roman legions, all that remained of the Jewish Temple buildings was a part of the western retaining wall, about 90 feet long and, after the last clearance of 1967, about 80 feet high. On the adjoining plate we can count twelve courses of carefully hewn squared stone, and these are undoubtedly from the time of Herod. Some of the blocks are fifteen feet long and six feet high. Below ground level there are another seventeen such courses, going down about sixty feet, completely buried by the debris of destruction from various wars. Older parts of the wall may go back to the second Temple, and the lowest to the time of Solomon.